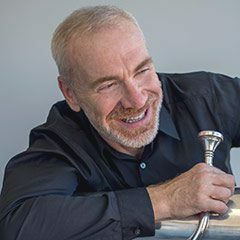 “A player of astonishing flamboyance” (Los Angeles Times) and “impressive dash” (Orange County Register), Doug Tornquist has been a part of Southern California’s freelance musical world since 1987, including serving as principal tuba for the Long Beach Symphony. He grew up on a farm in the San Joaquin Valley, and came to Los Angeles for his Bachelor’s degree at the University of Southern California where he studied with Jim Self and Tommy Johnson. He earned his Master’s degree from Wichita State University, where he played with the WSU faculty brass quintet, the Wichita Symphony Orchestra and toured with the St. Louis Symphony under the baton of Leonard Slatkin. Tournquist returned to Los Angeles in 1987 to earn his Doctor of Musical Arts degree from USC and soon became a busy freelance performer, playing everywhere from amusement parks to the ballet, opera and symphony (sometimes on the same day!). He has played with the Los Angeles Philharmonic, the Los Angeles Opera, Pacific Symphony, the Hollywood Bowl Orchestra, Long Beach Symphony and all the regional orchestras in Southern California and under the batons of Erich Leinsdorf, Pierre Boulez, Zubin Mehta, Esa Pekka Salonen, Gustavo Dudamel, Witold Lutoslawski, and Valerie Gergiev. He has recorded with Diana Krall, Neil Diamond, Barbra Streisand, Josh Groban, Randy Newman, Meat Loaf, and Beck, among others. Since his first recording in 1989 for the film score for Edward Scissorhands, he’s played on the soundtracks of over 400 films, TV shows and video games. He was the voice of Wreck it Ralph and played on John Williams’s two most recent scores for Star Wars: The Force Awakens and The Big Friendly Giant. Among his more notable recordings are the GRAMMY Award-winning premiere recording of the Penderecki Credo with the Oregon Bach Festival, two discs with Quintadillac, a German brass quintet, and the song from John Lithgow’s childrens’ book, I’m a Manatee, which features him as a soloist. He recently released a solo CD, Feels Like Far, and produced a CD of holiday brass music, Fiat Lux. Tournquist teaches at the USC Thornton School of Music, California Institute of the Arts, and the Colburn School.